Knights of Veritas was formed in late 2004 after Director Eric Slyter, having retired from years of performing in the Northwestern US renaissance faire circuit, decided to focus on educational avenues rather than entertainment ones. Eric's passion had always been educating the public about accurate medieval history, and he decided to specialize in educational presentations for schools and libraries by forming an organization devoted to doing just that. Thus, Knights of Veritas was created, and immediately made its mark with prestigious bookings at at the Seattle Art Museum in conjunction with armour displayed at SAM's Spain in the Age of Exploration exhibit. Starting in 2005, Knights began travelling extensively throughout Washington State and the Pacific Northwest, staking its claim as the premier professional presenters on the subjects of arms, armour, knighthood and chivalry of the middle ages. Knights of Veritas became a state-recognized non-profit educational organization in late 2005, becoming a Federally recognized 501(c)(3) non-profit in 2011. 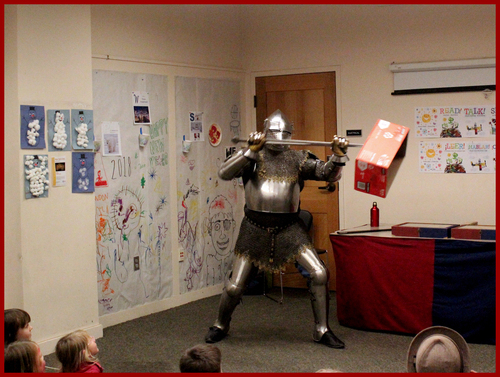 Knights of Veritas remains dedicated to providing exciting, engaging and professional educational presentations for schools, libraries, homeschool groups and other educational partners all throughout the Pacific Northwest.